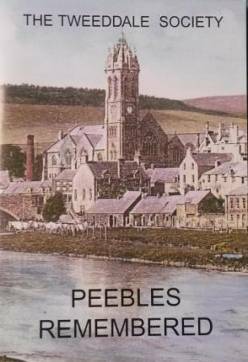 Transcripts of oral history interviews conducted by the Tweeddale Society in which older residents of Peebles recount their memories of growing up in the area. Collected and edited by Susan Stewart, John Rogers, Marjorie Renton, Margaret Brown and David Beadle, members of the Council of the Tweeddale Society. Contains old photographs and drawings. Published by the Tweeddale Society, 2005. This may be purchased at Society lectures or from Whitie’s Booksellers, Pennel’s Close, Peebles. A short history of the Society since its inauguration on 12th March 1913, including several photographs of Society events during the last 100 years. Published by the Tweeddale Society, 2013. The Society was involved in conjunction with the Scottish Borders Council Museum Service in the re-issue of Gleanings from Grandfather’s Attic. This is a collection of papers retrieved from the attic of J & W Buchan, W.S. by the late Sheila Scott (with the help of Eric Stevenson) which provide a fascinating insight into life in an earlier age. The papers are available in booklet form and as a CD-ROM (JPEG, TIFF, PDF). Sheila Scott was a noted local historian and active member of the Tweeddale Society. She was much involved in the setting up of the John Buchan Centre in Broughton. These papers were one of several publications Miss Scott produced. Copies can be borrowed from Peebles Library.